The Easter story has been told and re-told in countless ways over the last 2,000 years. 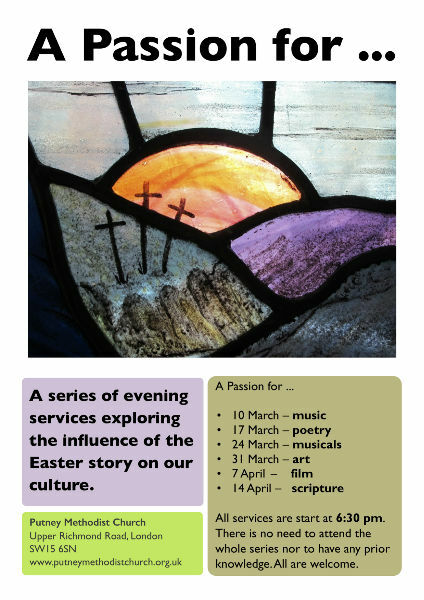 During Lent this year at Putney, we shall be considering the influence of the Passion story in a number of different fields, reflecting on how the events of Holy Week have been relayed through a different medium each Sunday evening. From the music of J S Bach to the art of Marc Chagall, and with everything in between. In the final service (on Palm Sunday), we shall reflect on the different emphases and nuances that the four gospel writers brought to their telling of the story. Please feel free to join us for any or all of the sessions.